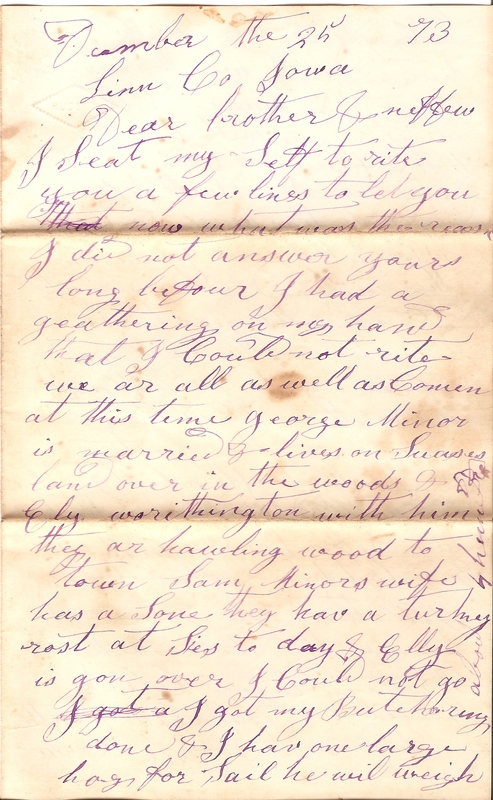 Though I have been collecting documents, photographs and family stories for three years, and writing a blog for almost two, I have never tried to systematically record my genealogical information. Now that I have amassed enough treasure to genuinely call myself a genealogist/family historian, I feel compelled to organize it – to better tell my stories and to refine my research. I am fortunate in that my treasures include a great many primary sources: family Bibles, postcards, pension files, letters and ledgers, in addition to those sources plucked from internet repositories. I need genealogy software that will help me structure data, source it thoroughly and bundle it with transcriptions, summaries and media. After asking around my +google circles and doodling with a downloaded trial or two, I settled on RootsMagic 5. The sea of data has threatened to drown me more than once in the past couple of months. Even with a nifty new program I was daunted by the work that lay ahead of me. Just pick an ancestor NOW, said a cyber colleague. Just start entering data, NOW. Start climbing the software’s learning curve NOW. 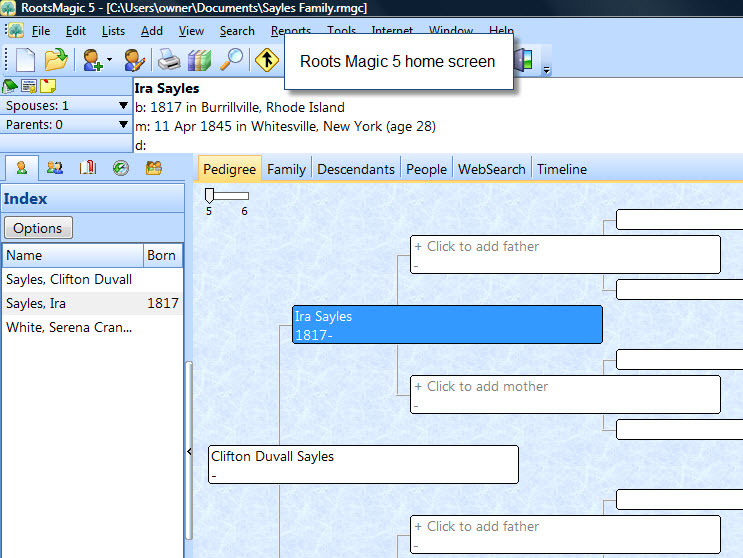 So I selected an ancestor, Ira Sayles and Serena, his wife, and just started using Roots Magic 5. 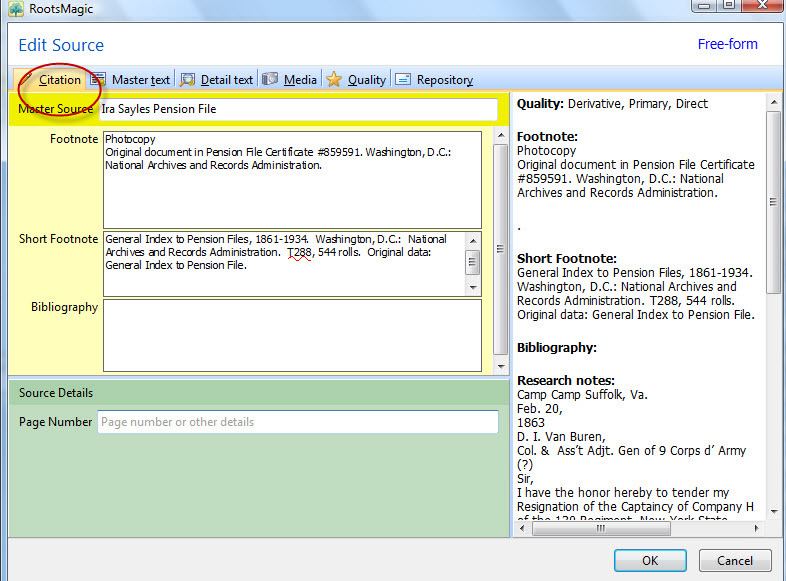 Innocently I chose the 1894 Civil War Pension File, because I wanted to reread the documents within the set and because I remembered that these primary sources contained a rich assortment of dates, names, occupations, etc. Almost immediately I was struck numb with doubt. How will I ever structure this information so that I capture MORE than dates? How will I capture stories of his health? His Civil War service? Then the magic of the software appeared. The home screen of RootsMagic has a familiar appearance, and is constructed for intuitive use. Double clicking the person of interest brings up an edit screen. 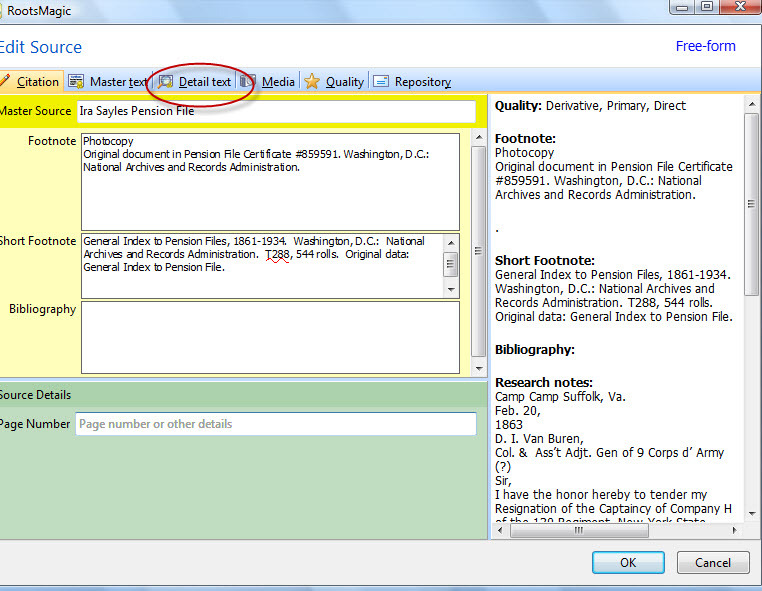 As you can see, Ira Sayles served during the Civil War; he applied for an Invalid Pension in 1893. One of my first genealogical research trips was to the National Archives in Washinton, D.C., where my request to see the contents of pension application 1124613 returned a whole sheaf of papers. Over the New Year holiday I began rereading them, and recording the data in no particular order. Soon I had three separate entries documenting the fact that Ira Sayles had served in Virginia and succumbed to prolonged exposure and fatigue. Unable to fulfill his duties as Captain of Company H, 130th Regiment New York Volunteers, he resigned in February of 1863. Suddenly I was swept up in the urge to differentiate these sources further so that each perspective about that resignation was recorded. Determinedly I delved into the full power of RootsMagic. 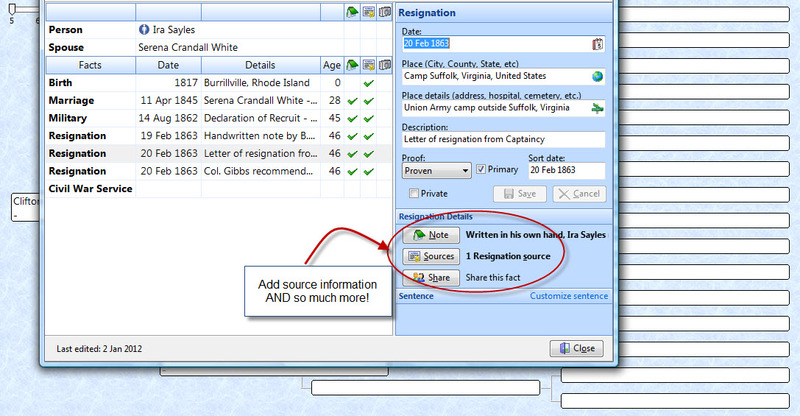 I selected one of my resignation facts – Ira’s letter of resignation – and started clicking tabs. When you click the source button for your fact this page is brought up. What a perfectly lovely sight! 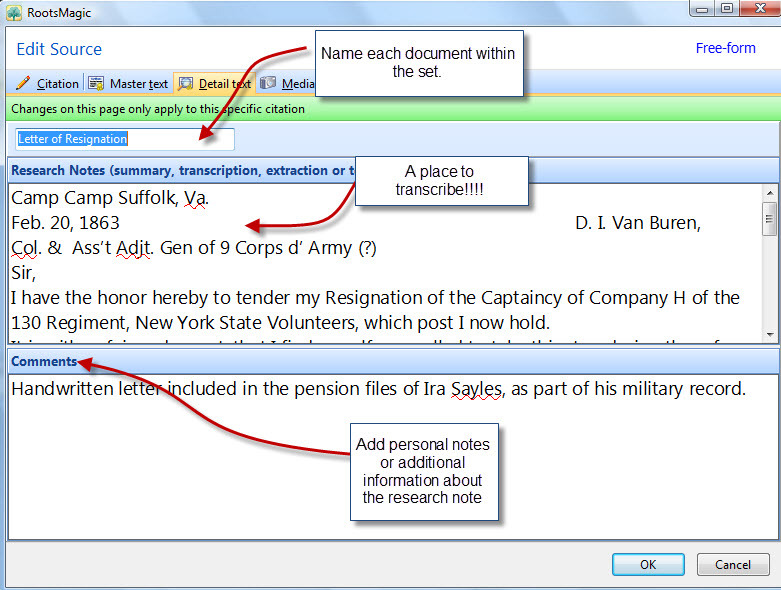 The changes on this page apply ONLY to the specific citation; here you can name your document, attach your transcription or research note AND write down any further information that you want captured! So here I am, three days into my RM5 learning curve, and I already know how to capture information as structured data, how to cite my source AND how to bundle the data with transcriptions, research notes and summaries. Magical. Previous Article If I Could Send You a Happy New Year Card, It Would Be. . .
Do you know about the webinars? WOW! What an interesting line-up of tutorials! Can’t wait to listen in. Thanks for the tip! Thanks for this post. I switched to RM4 last fall, didn’t do much with it, then RM5 came out and Christmas was here. I finally downloaded RM5 late last week and am in about the same place you are, learning how to use it. 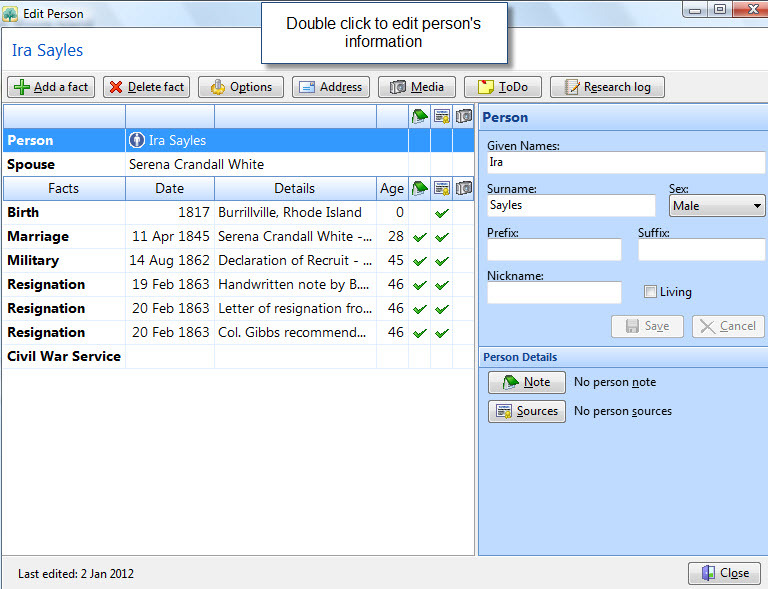 Sources are an important aspect of recording family history and I think RM has great options. I just need to learn the program and become comfortable. Again, I appreciate the post. Thanks for the heads up about entering each item as a separate document. I hadn’t thought about its effect on the timeline but that’s a good point, especially when trying to look at a life in chronological order.